The COVR Awards-- I won! I won! What's in that box? CONTEST! Waaayyyy back in 2005, I sent a proposal in to Llewellyn Worldwide Publishing, and got a reply from a woman named Elysia Gallo saying, "I'd like to read more." Bless her heart. That was the beginning of something wonderful--my relationship with my acquisitions editor, whose birthday is today. Over the course of the last six years (and six books, counting the current one), Elysia has worked tirelessly to make me a better author, shepherded me through the many hurdles of being a published writer, and (occasionally) kept me from shooting myself in the foot. We first got to meet in person at Pantheacon in 2008, and that was the beginning of something even more wonderful--a friendship based on mutual respect and many shared interests. We both love books, of course, and Witchy things, and cats. And we both have gorgeous foreign husbands (no, wait--that's just her) and fascinating careers in the publishing industry (no, dang it--her again). Well, we have a lot in common. And also, she is one of the smartest, funniest, all-around cool people I know. We are professionals first, and never lose track of that. But we also have a lot of fun together, even when we are being "Editrix" and "Authoress." If you are an author, I hope you are lucky enough to get an editor like this. And if you're not, I hope you get to have someone this nice as a friend. So happy birthday, Editrix. Getting to know you has been one of the best "perks" of being published. 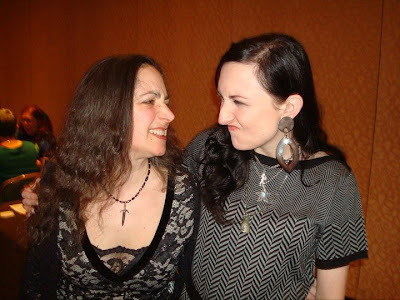 My step-daugher Jenn, me and Elysia eating out during Pantheacon in 2011. No, we don't get along at all! In this case, the lion in question is Mystic, my giant (almost 17 lbs) gray cat. The one who, for unknown reasons, took an unswerving dislike to little Samhain (less than 7 lb) the day she moved in. Mystic is very aggressive towards her, even though she's now lived with us for about 3 years; he will attack her with no provocation, and I have to keep her upstairs when I'm not around to watch out for her. Which is why I was so stunned when I walked into the living room about three weeks ago and saw this scene. Mind you, it was merely a temporary cease-fire, and Samhain looks extremely dubious about the whole thing, but still, it was very hopeful. There were so many great comments, it was almost impossible to chose a winner...so I chose three! Contact me at magicmysticminerva at yahoo to give me your names and addresses, and I'll send the books right out. And thanks again to everyone who took part--it was the most fun contest I ever did! As y'all know, I won the COVR "Visionary" Award for Best Wicca/Paganism Book with my latest, Witchcraft on a Shoestring (Llewellyn, 2010). The book contains, among other things, an assortment of inexpensive recipes and craft projects. Tell me what your favorite recipe or project is, or which ones you have done (along with how you did them, or what happened, or any other personal tidbit). The most interesting response will get put up on my website, and the person who submitted it will win a free autographed copy of Witchcraft on a Shoestring or any other of my books. Contest will run through Friday, so you have plenty of time to think about it, and spread the word (pretty please). Oddly enough, the award statuette actually goes to Llewellyn (pout), but I get to hang this shiny sign on my wall, and from now on, I can call myself an "Award-winning author." So how should I celebrate? Obviously, by giving away a copy of Witchcraft on a Shoestring to some lucky blog reader! Any suggestions on a contest or way to pick someone to win the book? For those of you who weren't around yesterday, you missed all the fun! I posted a picture of a LARGE and MYSTERIOUS BOX, and asked people to guess what was in it. The winner would get part of what was inside. As you can see from the picture above, what was inside was LOTS and LOTS of BOOKS. Many people guessed that the box contained copies of my newest book, but since my newest book is being written right now, alas, that wasn't true. The books, as winners ROBENA and SIERRA so cleverly surmised, are my booty from my recent trip to NYC and RWA. Some of them I bought at the literacy signing, and some I picked up at the various publisher book signings, and some were given out during the course of the conference. And, to be fair, about a third of that pile are autographed for and destined to be given to my pal Robin, who was supposed to go this year and couldn't. Most of the books I picked up for myself are signed to me. But there are nine books that are up for grabs, and winners Sierra and Robina get to pick one of those and I will send it to them as their prize! NOTE: Robena and Sierra can email me at magicmysticminerva at yahoo or contact me at the BettyVerse in FB so they can tell me their choice and give me an address to sent it to. This was so much fun--I think I'll have to mail myself mysterious boxes more often!!! Thanks to everyone who took part. There is a little bit of everything here: historical romance by Grace Burrowes (HEIR) and Mary Nalogh (A SECRET AFFAIR), two SF/paranormal romance by Joss Ware (BEYOND THE NIGHT, EMBRACE THE NIGHT ETERNAL), paranormal romance from Stephanie Rowe (TOUCH IF YOU DARE), Jenna Black (THE DEVIL'S PLAYGROUND), and Kristina Douglas (our own Krissie/Anne Stuart RAZIEL), a romantic suspense by Susan Crandall (SLEEP NO MORE), and a contemporary romance by Lori Wilde (THE FIRST LOVE COOKIE CLUB). Okay--I feel bad that yesterday's post about Samhain was such a downer. So today we're going to do something much more fun. This large and mysterious box came for me yesterday. (And yes, I know what's in it.) The first person who can correctly guess--specifically--what is inside will win a prize. And yes, the prize is in the box, too. Ready, set, go--what's in the box? Back in April, I put up a blog post about my cat Samhain (pronounced sow-wen, like the Pagan holiday). Samhain is a little calico cat I adopted from the shelter a few years ago, when she was probably 3 or 4 (she was a stray, so there is no way to know for sure). In September of 2009, she went in for her regular physical and we discovered that she had gone from an already-tiny 7 lbs down to 5.5 lbs. The blood tests confirmed that she had Chronic Renal Failure, or CRF. For a while, she did pretty well. I gave her subcutaneous fluids at home 3X a week, put her on a special food, and tried to keep my giant cat Mystic from beating the crap out of her for no particular reason. (He doesn't like her. Apparently that's reason enough, if you're a cat.) Her blood test numbers improved, she put back on all the weight she'd lost, and regained her feisty attitude. Until a few months ago. As I said in April, as of March, the numbers started to climb again, and that's Not Good. But at least she hadn't lost any weight. Today, we went for another check-up, and the numbers had shot up again. Not crept up, which is what I'd hoped for. Shot up. Last month her creatine was 5.2 and this month it is 6.2 -- Not Good. And she'd gone from 7.1 lbs to 6.7 lbs. Even giving her the fluids every day. What does all this mean? Well, it probably means that I have less time left with her than I'd hoped. Dang it. Of course, I'd hoped for a lot. This is one sweet cat. And it means that every day with her is that much more valuable. And on the bright side, she STILL hasn't gotten the memo. The blood tests may say she's going downhill, but you couldn't tell from looking at her. She is still perky and feisty and determined to have everything her own way. And that's okay with me.